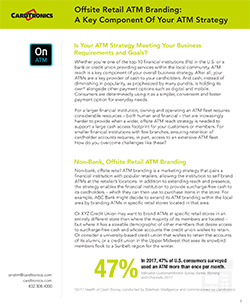 Is Your ATM Strategy Meeting Your Business Requirements and Goals? Whether you're one of the top 10 financial institutions (FIs) in the U.S. or a bank or credit union providing services within the local community, ATM reach is a key component of your overall business strategy. After all, your ATMs are a key provider of cash to your cardholders. And cash, instead of diminishing in popularity, as prophesized by many pundits, is holding its own* alongside other payment options such as digital and mobile. Consumers are determinedly using it as a simpler, convenient and faster payment option for everyday needs. For a larger financial institution, owning and operating an ATM fleet requires considerable resources – both human and financial – that are increasingly harder to provide when a wider, offsite ATM reach strategy is needed to support a large cash access footprint for your customers or members. For smaller financial institutions with few branches, ensuring retention of cardholder accounts requires, in part, access to an extensive ATM fleet. How do you overcome challenges like these? Download the white paper to learn more about the business case for Offsite Retail ATM Branding and how it benefits financial institutions. © 2019 Cardtronics. All rights reserved.